Location in Lebanon. The surrounding district can be seen on the map. Beirut is the capital of Lebanon. It is one of the oldest continuously inhabited cities of the world. It is situated on a hilly promontory on the eastern Mediterranean surrounded to the east by the snow-capped mountains of Lebanon. Before the civil war it was a cultural center of the Arab World, a major international financial, banking and media center and was called the Switzerland of the Middle East. Beirut was settled more than 5,000 years ago. Its name derives from the Canaanite-Phoenician be'erot ("wells"), referring to the underground water table that is still tapped by the local inhabitants for general use. Another version is that the city was named after the Phoenician daughter of Adonis and Aphrodite, Beroe. Excavations in the downtown area have unearthed layers of Phoenician, Hellenistic, Roman, Byzantine, Arab, Crusader and Ottoman remains. The first historical reference to Beirut dates from the 14th century BC, when it is mentioned in the cuneiform tablets of the Amarna letters, three letters that Ammunira of Biruta (Beirut) sent to the pharaoh of Egypt. Biruta is also referenced in the letters from Rib-Hadda, king of Byblos (also known as Jbeil). The oldest settlement was on an island in the river that progressively silted up. The city was known in antiquity as Berytus. This name was taken in 1934 for the archaeological journal published by the Faculty of Arts and Sciences at the American University of Beirut. In 140 B.C. the city was destroyed by Diodotus Tryphon in his contest with Antiochus VII Sidetes for the throne of the Macedonian Seleucid monarchy. Beirut was soon rebuilt on a more conventional Hellenistic plan and renamed Laodicea in Phoenicia (Greek: Λαοδίκεια ἡ ἐν Φοινίκῃ) or Laodicea in Canaan in honor of a Seleucid Laodice. The modern city overlies the ancient one, and little archaeology was carried out until after the end of the civil war in 1991. The post-war salvage excavations (1993-to date) have yielded new insights in the layout and history of Berytus. Public architecture included several bath complexes, colonnaded streets, a circus and theater; residential areas were excavated in the Future Garden of Forgiveness, Martyrs' Square and the Beirut Souks. Mid-first-century coins from Berytus bear the head of Tyche, goddess of fortune; on the reverse, the city's symbol appears: a dolphin entwines an anchor. This symbol was later taken up by the early printer Aldus Manutius in 15th century Venice. Beirut was conquered by Pompey in 64 B.C. The city was assimilated into the Roman Empire, veteran soldiers were sent there, and large building projects were undertaken. Beirut was considered the most Roman city in the eastern provinces of the Roman Empire. In 14 B.C., during the reign of Herod the Great, Berytus became a colonia and was named Colonia Iulia Augusta Felix Berytus. Its law school was widely known; two of Rome's most famous jurists, Papinian and Ulpian, both natives of Phoenicia, taught there under the Severan emperors. When Justinian assembled his Pandects in the 6th century, a large part of the corpus of laws was derived from these two jurists, and in 533 Justinian recognized the school as one of the three official law schools of the empire. After the 551 Beirut earthquake the students were transferred to Sidon. Beirut passed into Arab control in 635. Prince Arslan bin al-Mundhir founded the Principality of Sin-el-Fil in Beirut in 759 AD. From this principality developed the later Principality of Mount Lebanon, which was the basis for the establishment of Greater Lebanon, today's Lebanon. As a trading centre of the eastern Mediterranean, Beirut was overshadowed by Acre during the Middle Ages. From 1110 to 1291 it was in the hands of the Crusaders' Kingdom of Jerusalem. John of Ibelin, the Old Lord of Beirut (1179–1236) rebuilt the city after the battles with Saladin and also built the Ibelin family palace in Beirut. Under the Ottoman sultan Selim I (1512–1520), the Ottomans conquered Syria including present-day Lebanon. Beirut was controlled by local Druze emirs throughout the Ottoman period. One of them, Fakhr-al-Din II, fortified it early in the 17th century, but the Ottomans reclaimed it in 1763. With the help of Damascus, Beirut successfully broke Acre's monopoly on Syrian maritime trade and for a few years supplanted it as the main trading centre in the region. 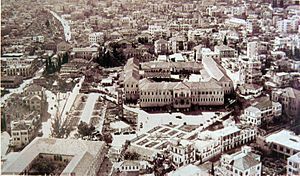 During the succeeding epoch of rebellion against Ottoman hegemony in Acre under Jezzar Pasha and Abdullah Pasha, Beirut declined to a small town with a population of about 10,000 and was an object of contention between the Ottomans, the local Druze, and the Mamluks. After Ibrahim Pasha of Egypt captured Acre in 1832, Beirut began its revival. By the second half of the nineteenth century, Beirut was developing close commercial and political ties with European imperial powers, particularly France. European interests in Lebanese silk and other export products transformed the city into a major port and commercial centre. This boom in cross-regional trade allowed certain groups, such as the Sursock family, to establish trade and manufacturing empires that further strengthened Beirut's position as a key partner in the interests of imperial dynasties. Meanwhile, Ottoman power in the region continued to decline. Sectarian and religious conflicts, power vacuums, and changes in the political dynamics of the region culminated in the 1860 Lebanon conflict. Beirut became a destination for Maronite Christian refugees fleeing from the worst areas of the fighting on Mount Lebanon and in Damascus. This in turn altered the ethnic composition of Beirut itself, sowing the seeds of future ethnic and religious troubles there and in greater Lebanon. However, Beirut was able to prosper in the meantime. This was again a product of European intervention, and also a general realization amongst the city's residents that commerce, trade, and prosperity depended on domestic stability. In 1888, Beirut was made capital of a vilayet (governorate) in Syria, including the sanjaks (prefectures) Latakia, Tripoli, Beirut, Acre and Bekaa. By this time, Beirut had grown into a cosmopolitan city and had close links with Europe and the United States. It also became a centre of missionary activity that spawned educational institutions, such as the American University of Beirut. Provided with water from a British company and gas from a French one, silk exports to Europe came to dominate the local economy. After French engineers established a modern harbor in 1894 and a rail link across Lebanon to Damascus and Aleppo in 1907, much of the trade was carried by French ships to Marseille. French influence in the area soon exceeded that of any other European power. The 1911 Encyclopædia Britannica reported a population consisting of 36,000 Muslims, 77,000 Christians, 2,500 Jews, 400 Druze and 4,100 foreigners. At the start of the 20th century, Salim Ali Salam was one of the most prominent figures in Beirut, holding numerous public positions including deputy from Beirut to the Ottoman parliament and President of the Municipality of Beirut. Given his modern way of life, the emergence of Salim Ali Salam as a public figure constituted a transformation in terms of the social development of the city. After the collapse of the Ottoman Empire following World War I, Beirut, along with the rest of Lebanon, was placed under the French Mandate. Lebanon achieved independence in 1943, and Beirut became the capital city. The city remained a regional intellectual capital, becoming a major tourist destination and a banking haven, especially for the Persian Gulf oil boom. This era of relative prosperity ended in 1975 when the Lebanese Civil War broke out throughout the country. During most of the war, Beirut was divided between the Muslim west part and the Christian east. The downtown area, previously the home of much of the city's commercial and cultural activity, became a no man's land known as the Green Line. Many inhabitants fled to other countries. About 60,000 people died in the first two years of the war (1975–1976), and much of the city was devastated. A particularly destructive period was the 1978 Syrian siege of Achrafiyeh, the main Christian district of Beirut. Syrian troops relentlessly shelled the eastern quarter of the city, but Christian militias defeated multiple attempts by Syria's elite forces to capture the strategic area in a three-month campaign later known as the Hundred Days' War. Rafic Hariri was assassinated in 2005 near the Saint George Hotel in Beirut. A month later about one million people gathered for an opposition rally in Beirut. The Cedar Revolution was the largest rally in Lebanon's history at that time. The last Syrian troops withdrew from Beirut on 26 April 2005, and the two countries established diplomatic relations on 15 October 2008. 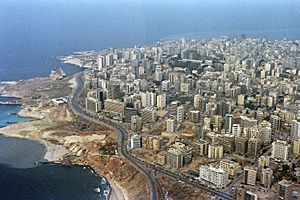 During the 2006 Lebanon War, Israeli bombardment caused damage in many parts of Beirut, especially the predominantly Shiite southern suburbs of Beirut. On 12 July 2006, The Hezbollah, code named “True Promise” ended with 8 Israeli deaths and 6 injuries. In response, the IDF targeted Hezbollah’s main media outlets. There were then artillery raids against targets in southern Lebanon, and the Israeli cabinet held Beirut responsible for the attacks. Then on 13 July 2006 Israel began implementing a naval and air blockade over Lebanon; during this blockade Israel bombed the runways at Beirut International Airport and the major Beirut-Damascus highway in Eastern Lebanon. In May 2008, after the government decided to disband Hezbollah's communications network (a decision it later rescinded), violent clashes broke out briefly between government allies and opposition forces, before control of the city was handed over to the Lebanese Army. After this a national dialogue conference was held in Doha at the invitation of the Prince of Qatar. The conference agreed to appoint a new president of Lebanon and to establish a new national government involving all the political adversaries. As a result of the Doha Agreement, the opposition's barricades were dismantled and so were the opposition's protest camps in Martyrs' Square. On 19 October 2012, a car bomb killed eight people in the Beirut's neighbourhood of Achrafiyeh, including Brigadier General Wissam al-Hassan, chief of the Intelligence Bureau of the Internal Security Forces. In addition, 78 others were wounded in the bombing. It was the largest attack in the capital since 2008. On 27 December 2013, a car bomb exploded in the Central District killing at least five people, including the former Lebanese ambassador to the U.S. Mohamad Chatah, and wounding 71 others. Beirut sits on a peninsula extending westward into the Mediterranean Sea about 94 km (58 mi) north of the Lebanon-Israel border. It is flanked by the Lebanon Mountains and has taken on a triangular shape, largely influenced by its situation between and atop two hills: Al-Ashrafieh and Al-Musaytibah. The Beirut Governorate occupies 18 square kilometres (6.9 sq mi), and the city's metropolitan area 67 square kilometres (26 sq mi). The coast is rather diverse, with rocky beaches, sandy shores and cliffs situated beside one another. Beirut has a hot-summer Mediterranean climate (Köppen: Csa) characterized by mild days and nights. Autumn and spring are warm, winter is mild and rainy, and summer can be virtually rainless. August is considered the only really hot muggy month, with a monthly average high temperature of 32 °C (90 °F), and January and February are the coldest months, with a monthly average low temperature of 11 °C (52 °F). The prevailing wind during the afternoon and evening is from the west (onshore, blowing in from the Mediterranean); at night it reverses to offshore, blowing from the land out to sea. The average annual rainfall is 825 millimetres (32.5 in), with the majority falling in winter, autumn and spring. Much of the autumn and spring rain falls in heavy downpours on a limited number of days, but in winter it is spread more evenly over a large number of days. Summer receives very little rainfall, if any. Snow is rare, except in the mountainous eastern suburbs, where snowfall is common due to the region's high altitudes. See Marine environmental issues in Lebanon. Lebanon, specifically Beirut and its suburbs, suffered a massive garbage crisis, mainly from July 2015 up to March 2016. The issue began when authorities shut down the main landfill site originally for Beirut’s garbage southeast of the city and failed to provide any alternative solutions for months. As a result, garbage mounted in the streets in Greater Beirut and caused protests to erupt, which sometimes invoked police action. This problem was commonly blamed on the country’s political situation. This garbage crisis birthed a movement called “You Stink” which was directed at the country's politicians. In March 2016, the government finally came up with a so-called temporary solution to establish two new landfills East and South of the city to store the garbage, while several municipalities across the country, in an unprecedented move, began recycling and managing waste more efficiently, building waste-management facilities and relying on themselves rather than the central government. These quarters are divided into sectors (secteurs). Badaro is an edgy, bohemian style neighborhood, within the green district of Beirut (secteur du parc) which also include the Beirut Hippodrome and the Beirut Pine Forest and the French ambassador's Pine Residence. It is one of Beirut's favorite hip nightlife destination. Two of the twelve official Palestinian refugee camps in Lebanon are located in the southern suburbs of Beirut: Bourj el-Barajneh and Shatila. There is also one within its municipal boundaries: Mar Elias. 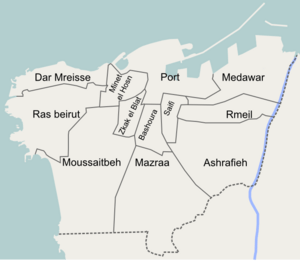 Of the fifteen unregistered or unofficial refugee camps, Sabra, which lies adjacent to Shatila, is also located in southern Beirut. People in Lebanon often use different names for the same geographic locations, and few people rely on official, government-provided street numbers. Instead, historic and commercial landmarks are more common. No population census has been taken in Lebanon since 1932, and estimates of Beirut's population range from as low as 938,940 through 1,303,129 to as high as 2,012,000 as part of Greater Beirut. 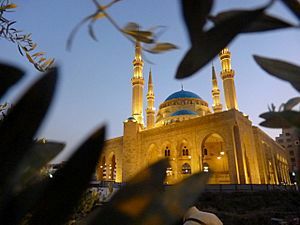 Beirut is one of the most cosmopolitan and religiously diverse cities of Lebanon and all of the Middle East. The city boasts significant Christian and Muslim communities. In Beirut there are 18 recognized religious groups. At the end of the civil war the Copts became another recognized confession, bringing the total number to eighteen. The original seventeen included four Muslim sects: Sunni, Shi'a, 'Alawi, and Druze; Twelve Christian sects: Assyrians, Syriac, Catholics, Syriac Orthodox, Chaldean, Maronites, Roman Catholics, Greek Catholics, Greek Orthodox, Armenian Orthodox, Armenian Catholics, evangelicals, and smaller Christian sects, which are considered one group; and Jews (very few remain in Lebanon today, but children of Lebanese Jewish parents may register as citizens at Lebanese Embassies. Family matters such as marriage, divorce and inheritance are still handled by the religious authorities representing a person's faith (the Ottoman "millet" system). Calls for civil marriage are unanimously rejected by the religious authorities, but civil marriages held in another country are recognized by Lebanese civil authorities. Until the mid-20th century, Beirut was also home to a Jewish community in the Bab Idriss sector of Zokak el-Blat. Before the civil war the neighborhoods of Beirut were fairly heterogeneous, but they became largely segregated by religion since the conflict. East Beirut has a mainly Christian population with a small Muslim minority, while West Beirut has a Sunni Muslim majority with small minorities of Christians and Druze. Since the end of the civil war, East and West Beirut have begun to see an increase in Muslims and Christians moving into each half. The southern suburbs are populated largely by Shia Muslims, while the eastern and northern suburbs are largely Christian. The city is also home to a small number of Latin Rite Roman Catholics in the form of an apostolic vicariate with Archbishop Paul Dahdah, OCD, as the apostolic vicar. 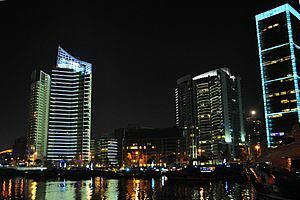 The Beirut Central District (BCD) or Centre Ville is the name given to Beirut's historical and geographical core by "Solidere", the "vibrant financial, commercial, and administrative hub of the country." It is an area thousands of years old, traditionally a focus of business, finance, culture and leisure. Its reconstruction constitutes one of the most ambitious contemporary urban developments. Due to the devastation incurred on the city center from the Lebanese Civil War, the Beirut Central District underwent a thorough reconstruction and development plan that gave it back its cultural and economic position in the region. Ever since, Beirut Central District has evolved into an integrated business and commercial environment and the focus of the financial activity in the region. That evolution was accompanied with the relocation of international organizations, reoccupation of civic and government buildings, expansion of financial activities, and establishment of regional headquarters and global firms in the city center. Roman baths park in Downtown Beirut. In an area dominated by authoritarian or militarist regimes, the Lebanese capital was generally regarded as a haven of liberalism, though a precarious one. 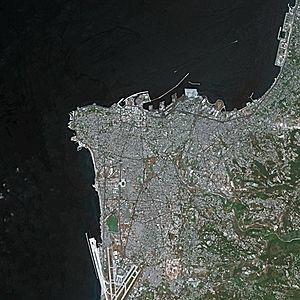 With its seaport and airport—coupled with Lebanon's free economic and foreign exchange system, solid gold-backed currency, banking-secrecy law, and favourable interest rates—Beirut became an established banking centre for Arab wealth, much of which was invested in construction, commercial enterprise, and industry (mostly the manufacture of textiles and shoes, food processing, and printing). The economy of Beirut is diverse, including publishing, banking, trade and various industries. During that period, Beirut was the region's financial services center. At the onset of the oil boom starting in the 1960s, Lebanon-based banks were the main recipients of the region's petrodollars. Beirut is the focal point of the Economy of Lebanon. The capital hosts the headquarters of Banque du Liban, Lebanon's central bank, the Beirut Stock Exchange, the head office of Lebanon's flag-carrier Middle East Airlines, the United Nations Economic and Social Commission for Western Asia, the Union of Arab Banks, and the Union of Arab Stock Exchanges. The Banking System is the backbone of the local economy with a balance sheet of $152 billion at the end of 2012, nearing 3.5 times the GDP estimated at $43 billion by the IMF. Bank deposits also increased in 2012 by 8% to 125 billion dollars, 82 percent of the sector's assets. "Banks are still attracting deposits because the interest rates offered are higher than the ones in Europe and the United States", says Marwan Mikhael, head of research at BLOM Bank. Beirut's foreign reserves were still close to an all-time high when they reached $32.5 billion in 2011 and analysts say that the Central Bank can cover nearly 80 percent of the Lebanese currency in the market. This means that the Central Bank can easily cope with any unforeseen crisis in the future thanks to the massive foreign currency reserves. The Lebanese banking system is endowed with several characteristics that promote the role of Beirut as a regional financial center, in terms of ensuring protection for foreign capital and earnings. The Lebanese currency is fully convertible and can be exchanged freely with any other currency. Moreover, no restrictions are put on the free flow of capital and earnings into and out of the Lebanese economy. 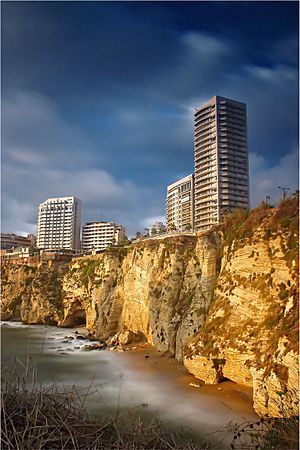 The tourism industry in Beirut has been historically important to the local economy and remains to this day to be a major source of revenue for the city, and Lebanon in general. 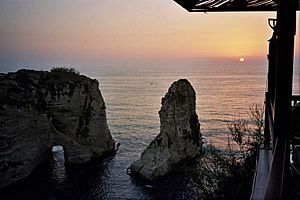 Before the Lebanese Civil War, Beirut was widely regarded as "The Paris of the Middle East," often cited as a financial and business hub where visitors could experience the Levantine Mediterranean culture. Beirut's diverse atmosphere and ancient history make it an important destination which is slowly rebuilding itself after continued turmoil. Although in recent times, certain countries such as the United States frequently place Lebanon and Beirut in particular, within their travel warnings list due to a large number of car bombings and orchestrated political violence. The largely pedestrianized Beirut Central District is the core of the Beirut tourism scene. The district is a cluster of stone-façade buildings lining arcaded streets and radial alleyways. The architecture of the area is a mix of French Architecture and Venetian Gothic architecture mixed with Arabesque and Ottoman Architecture. The district contains numerous old mosques and crusader churches, as well as uncovered remnants and ruins of the Roman era. 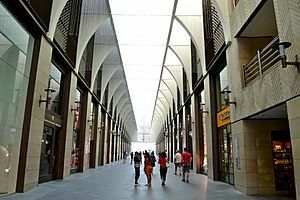 The District contains dozens of restaurants, cafes and pubs, as well as a wide range of shopping stores mainly in Beirut Souks. High-rise hotels and towers line the district's New Waterfront, marina and seaside promenade. Badaro is one of Beirut's most appealing neighborhoods, a lovely place to stroll during daytime and a destination for going out in the evening. 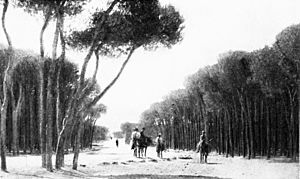 Badaro is within Beirut's green district with a 75-acre (30-hectare) public park (The Beirut Pine forest) and a 50-acre (20-hectare) hippodrome. It is a neighborhood on a very human scale with small groceries around every corner. The neighborhood residents, a mix of old impoverished Christian bourgeoisie, bohemian style people in their 30's and well-established urban professionals, are loyal to local bakery and pastry shops. Because of the blossoming café and bar scene it has become lately a hip destination for Beirut's young and restless but old Beirutis remember that Badaro was already Beirut's version of the Village in the swinging sixties. Groceries and eateries can be found on almost every street of the area. There are dozens of restaurants, pubs and sidewalk cafés of virtually every style. Badaro "Village" thrives on local residents, day-trippers and hipsters from all over Beirut, office employees and many expatriates. 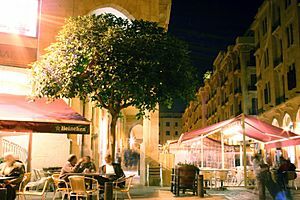 Contrary to areas such as Gemmayzé or Mar Mikhael, despite being very lively, pubs and cafes are keen on avoiding to make a lot of noise, and people are respectful and do not do things in public that they wouldn't want someone to do in front of their house. Gemmayzeh is Beirut's artistic Bohemian quarter, full of narrow streets and historic buildings from the French era. 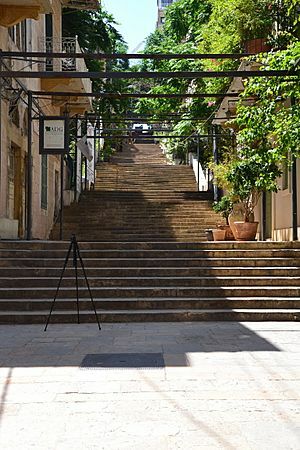 It is located East of the Beirut Central District, bordering the Saifi Village. The neighborhood is well known for its trendy bars and pubs, cafes, restaurants and lounges; most are directly located on Rue Gouraud, the main thoroughfare that cuts through the middle of the district. Travel + Leisure magazine called Gemmayzeh "SoHo by the Sea," due to its colorful and chic cafés amid 1950s apartment buildings and hole-in-the-wall shops. Beirut is a destination for tourists from both the Arab world and West. In Travel + Leisure magazine's World Best Awards 2006, it was ranked 9th best city in the world. 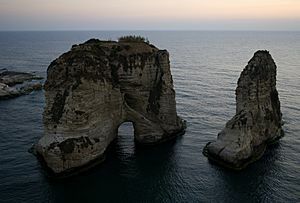 That list was voted upon shortly before the 2006 Lebanon War broke out, but in 2008 The Guardian listed Beirut as one of its top ten cities in the world. The New York Times ranked it at number One on its "44 places to go" list of 2009. 2011 MasterCard Index revealed that Beirut had the second-highest visitor spending levels in the Middle East and Africa, totaling $6.5 billion. Beirut was chosen in 2012 by Condé Nast Traveler as the best city in the Middle East, beating Tel Aviv and Dubai. Many of the tourists are returning Lebanese expatriates, but many are from Western countries. Approximately 3 million visitors visited in 2010; the previous record was 1.4 million in 1974. Like other forms of tourism, medical tourism in Lebanon is on the rise recently. Although visitors from neighboring Arab nations make up the bulk of medical tourism patients here due to its proximity, Beirut is strongly trying to woo more southern Europeans, Asians and North Americans to its land. Its Agency for Investment Development in Lebanon reports that growth in the medical tourism industry is growing by up to 30% a year since 2009. The country's tourism ministry is working closely with the medical sector and top-class hotels to create an organized, quality medical destination. Major hotel and spa chains work with local clinics, travel agencies and the tourism ministry to create comprehensive healthcare and recuperation packages for foreign visitors. The government is highly involved in this industry and strives to make the process as easy as possible. Cosmetic surgery is a major component of medical tourism in Lebanon. Most of the foreign patients come for routine operations like plastic surgery, dental or eye surgery, and Beirut's hospitals are also capable of performing specialized procedures such as internal bypass surgery and other technical treatments. Its top clinics and hospitals like Sahel General are equipped to handle the full range of surgical procedures. Beirut-based Clemenceau Medical Center (CMC), affiliated with Johns Hopkins International, was ranked one of the world's top ten best hospitals for medical tourism in 2012. The city's renovated airport is the Rafic Hariri International Airport, located in the southern suburbs. The Port of Beirut, one of the largest and most commercial in the eastern Mediterranean, is another port of entry. As a final destination, Lebanon can be reached by ferry from Cyprus via the nearby city of Jounieh or by road from Damascus via the Beqaa valley in the east. Beirut has frequent bus connections to other cities in Lebanon and major cities in Syria such as Homs and its capital Damascus. There are a number of different companies providing public transport in Lebanon. The publicly owned buses are managed by Office des Chemins de Fer et des Transports en Commun (OCFTC – "Railway and Public Transportation Authority"). Buses for northern destinations and Syria leave from Charles Helou Station. The ministry of transport and public works purchased an extra 250 intra and inter-buses in 2012 to better serve regions outside the capital as well as congestion-choked Beirut, hoping to lessen the use of private cars. Beirut has also private buses that are provided by the Lebanese Commuting Company. In 2017, Beirut introtuced a bike sharing service in certain areas of the city. The culture of Beirut has evolved under the influence of many different peoples and civilizations, such as Greeks, Romans, Arabs, Ottoman Turks and French. The law school in downtown Beirut was one of the world's earliest and was considered to be a leading center of legal studies in the Eastern Roman Empire. Beirut hosted the Francophonie and Arab League summits in 2002, and in 2007 it hosted the ceremony for the Prix Albert Londres, which rewards outstanding francophone journalists every year. The city also hosted the Jeux de la Francophonie in 2009. In the same year it was proclaimed World Book Capital by UNESCO. 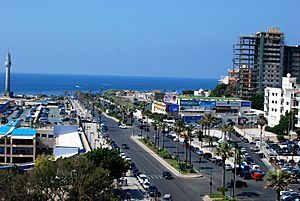 Beirut has also been called the "party capital of the Arab world". 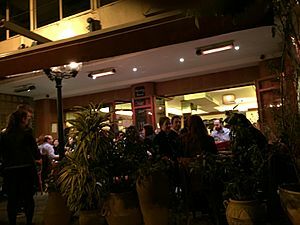 Rue Monnot has an international reputation among clubbers, and Rue Gouraud in districts such as Gemmayze and Mar Mikhael have emerged as new hotspots for bar patrons and clubbers, as well as "The Alleyway" in Hamra Street. The National Museum of Beirut is the principal museum of archaeology in Lebanon. It has about 1,300 exhibits ranging in date from prehistoric times to the medieval Mamluk period. 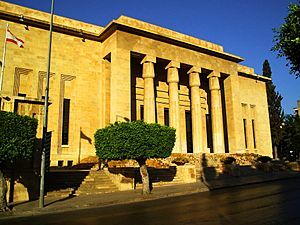 The Archaeological Museum of the American University of Beirut is the third oldest museum in the Middle East, exhibiting a wide range of artifacts from Lebanon and neighboring countries. 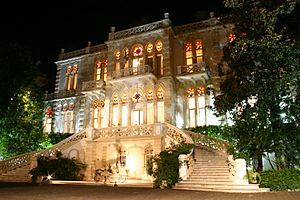 Sursock Museum was built by the illustrious Sursock family at the end of the 19th century as a private villa for Nicolas Sursock, and then donated to the Lebanese state upon his death. It now houses Beirut's most influential and popular art museum. The permanent collection shows a set of Japanese engravings, numerous works of Islamic art and classic Italian paintings, while temporary exhibitions are also shown throughout the year. The Robert Mouawad Private Museum near Beirut's Grand Serail exhibits Henri Pharaon's private collection of archaeology and antiques. Planet Discovery is a children's science museum with interactive experiments, exhibitions, performances, workshops and awareness competitions. The Saint Joseph University opened the Museum of Lebanese Prehistory in 2000, the first prehistory museum in the Arabic Middle East, displaying bones, stone tools and neolithic pottery collected by Jesuits. In October 2013, mim museum, a private mineral museum, opened its doors to the public. It has on display some 1600 minerals from more than 60 countries. mim museum's collection is considered to be one of the world's paramount private collection for the variety and quality of its minerals. A didactic circuit, accompanied by screens showing films and scientific applications of mineralogy, will reveal a world of unsuspected marvels—priceless both from an aesthetic and scientific point of view. Basketball is the most popular sport in Lebanon. Currently, 4 Beirut teams play in Lebanese Basketball League: Hekmeh, Sporting Al Riyadi Beirut, Homenetmen Beirut and Hoops. Other sports events in Beirut include the annual Beirut Marathon, hip ball, weekly horse racing at the Beirut Hippodrome, and golf and tennis tournaments that take place at Golf Club of Lebanon. Three out of the five teams in the Lebanese rugby league championship are based in Beirut. There are hundreds of art galleries in Beirut and its suburbs. Every year hundreds of fine art students graduate from universities and institutions. Artist workshops exist all over Lebanon. The inauguration of the Beirut Art Center, a non-profit association, space and platform dedicated to contemporary art in Lebanon, in the Mkalles suburb of Beirut added to the number of exhibition spaces available in the city, with a screening and performance room, mediatheque, bookstore, cafe and terrace. Adjacent to the latter is the Ashkal Alwan Home Workspace, a venue hosting cultural events and educational programs. Beirut Facts for Kids. Kiddle Encyclopedia.